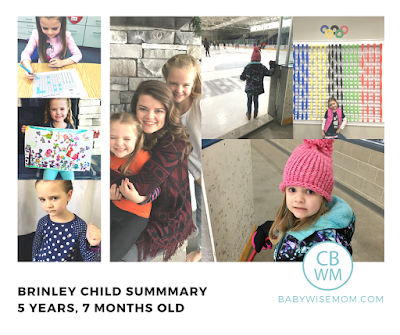 This is a summary for Brinley from 5.5-5 years 7 months old. Brinley goes to bed around 7:30-8:00. She has an okay to wake clock that turns green at 7:30 AM. We have strongly noticed that when she doesn’t get this much sleep, she is sassy and grumpy the next day. Because of that, we really strive for bedtime being on time. Right now, we let her look at books before she goes to sleep after being put in bed. None of our other kids had that ability this young because they didn’t have a light, but in her bed, she has an LED reading light. (McKenna had the light at this age, but she also shared with Kaitlyn who would tell her when it was time to turn the light off). We started having some sass going on and decided we had better give her the rule she can look at ONE book before she goes to bed. One book seems to be the right number for her right now. We have some major Kindertude going on. Or is it that she is the youngest child…or a combination? The more kids you have and/or the more space there is between the children age-wise, the trickier things get. You want things age-appropriate for all children, and that can be hard to accomplish. You want family activities and entertainment to work for all. I think the youngest gets involved in things just above their level and the oldest doesn’t get into things age-appropriate as early. So for Brinley, that invites some wise in own eyes opportunity. Even if she isn’t exposed, she sees siblings getting things and she fights for them, where Brayden at age 5 never dreamed that would be a freedom. She is a darling dream when it is just she and I, but when the rest of the family comes home, she has some major diva moments. I have always shared that she has a hard time when her schedule is off, which happens with the full family home. I am currently trying to figure out exactly what it is that is leading to her attitude and mood swings so I know exactly how to respond. School is good. Nothing new or interesting going on. This is what Brinley is doing outside of school. We have half-day Kindergarten, so she is able to do many things during what would be the school day, which is super nice. She will have to cut back next school year. Swimming lessons: she actually only had one lesson this month (or maybe none?). With our schedule and the teacher’s schedule, we haven’t been consistent. Hopefully once the musical is over we will be more on track. Gymnastics: she continues to get better and better. I am so glad she is doing this! I see her getting stronger and moving about in play with more confidence. I really feel like even just one year of gymnastics is so good for all kids. All of my kids, including Brayden, did at least one year. Piano: Piano is great. She even rarely needs my help to practice her piano, which is exciting. Musical: The musical is going well. We are almost done with it!